I wanted to like The Fires of a Nightmare. I really, really wanted to like it but I just didn't. I dislike writing reviews that were below three stars. Especially when the author is so nice but I thought this book was just okay, unfortunately.I must admit that books about demons (and angels) are probably my least favorite in the paranormal genre so maybe that was part of my dislike, who knows. Also I'm not the biggest fan of reincarnation stories. But I still wanted to try this one.I didn't like Lily all that much. Sure, she has fire and spirit that I admire but other than that I wasn't her biggest fan. She made a lot of bad decisions. A LOT. She kept putting herself in danger and needing rescue from Seth. That's just a big no-no for me. And Seth? He was a slightly better character in my opnion. As a half-demon, he's pretty dark and brooding. And I like that although he loves Lily, he can admit that things wouldn't work out for him because he's part demon and has been alive for centuries. Not that I don't want them to work out or anything. It just seems rational. The story wasn't too great for me, either. I mean, it was okay but that's where it ended. When Seth took Lily away, for her own protection, she didn't even get to call her parents to let them know she's okay. And I get that they wouldn't want to involve them but, really... I'd at least make one call to let them know I was okay and not to worry. But that's just me.There was a lot of action in this book also but I couldn't care for it. Normally I love action in a book. In fact, I find a book without action boring. But the fight scenes didn't sit well with me. I guess I just didn't like the writing. It was sort of choppy and didn't flow well. The conversations between Lily and Seth weren't my favorite either. But the one thing I did find possitive. And this is a pretty big deal to me... is that the love wasn't instantly. So, yeah, no insta-love... Their feelings for each other grew over the weeks. At least that's what it was like for Lily. I was really relieved over that because I genuinely think I wouldn't be able to handle another insta-love book.As I said before, I didn't like the writing but I liked it best when Lily was dreaming. I liked seeing how her other reincarnations died. That sounds kind of awful to say but that's where I liked the writing and story the best. Oh and the ending I think I liked the best. It was a pretty big twist that I hadn't seen coming. You see, I have a love/hate relationships with cliffhangers. I hate them but I love them also and this one was a pretty unexpected one!So overall, The Fire of a Nightmare wasn't my cup of tea. I do feel kind of bad for having to rate it so low but I'm always honest with the books I'm reading, especially those for review. I wanted to like this book so much but I guess you can't like everything. There were some possitive elements that I mentioned before so I hope nobody will be too scared off to read it. Other people might like this book a lot more than me. This is just my opnion and it wasn't a book for me, sadly enough. An interesting concept and take on demons. I liked how it stands out from other YA novels these days. The main character seemed a bit too accepting to me, though...maybe that's because she is a reincarnation who already has past knowledge of this, but this fact seemed more like a plot device to excuse lack of skepticism in our main character. Also, there was a lot of rule breaking with the "show, don't tell" guideline. The author would try to work it into the dialogue, but it came out as forced and awkward when she would say, "Tell me about him, Seth," or "Tell me about your mother, Seth," or even "Tell me what happened to her, Seth." There are definitely better ways to integrate backstory, flashback events, and character development other than forcing the characters to talk about them in a way that feels a bit cheesy and unnatural.I liked Seth's character, but even with him there were some discrepancies that I didn't really understand. He's supposed to be a half-demon...the son of demon lord Darcamius, and yet he's nice to Lily? He's only mean to her for like...eh, the first ten pages of their interaction together, then all of a sudden he's opening up, giving her a nice warm bedroom to sleep in. It just didn't add up to me. He was certainly a looker, though, and I wouldn't mind being kidnapped by that hunk of man meat.Another thing that was really cool: the glimpses into Lily's past lives. I thought that was interesting, since we got to really live through those other women and see what they experienced. This would've been an accurate way to explain what happened, instead of having Seth go on and on about for an entire chapter.Like I said earlier, the concept is awesome and original, something I haven't seen in a while. But the way it was executed, unfortunately, detracted from its potential.I enjoyed getting to know the characters, though, and their stories were interesting despite their cheesiness. Lily is supposedly this reincarnation, which is really awesome when you think about it...but half the time she's just sitting there harping Seth with questions or hiding out in a cabin with him to stay off Darcamius' radar. As far as female leads go, I've seen braver, smarter, and deeper characters.The ending was probably the best part of the whole book! The confrontation between Darcamius and Seth was pretty intense, though I'd have liked to see Lily do more than just lie there like a useless Bella Swan on the floor. The action got my skin to prickle and I actually got a little anxious for Seth. But the whole thing with him leaving....nooooooo. :( I didn't go through all that with you and Lily to watch you leave! Jerkface! >:( For a younger audience this would probably work nicely, since they will not overanalyze and get into the details like I would, but I feel it is necessary to bring up these things to help not only the readers, but also the author. Hopefully my critique has helped at least one person thinking of reading this book! This book was OK. It was solidly in the middle of the spectrum for a number of reasons. The writing was good, the plot line was good, it just wasn't great. It was fairly predictable. Good knight in shining white armor (or a dark angel) saves beautiful (however useless and stupid) damsel in distress. Over and over. And twice from her own idiocy. But sometimes you just need this kind of book. One of the purest kind of love that doesn't really exist in the real world, of predictable, dashing heroes and stupid, beautiful girls fighting against the usual kind of evil. Why read this book then? Because sometimes you just want good. Not amazing, not bad, just good. That filler book between books likeThe Fault in Our StarsandGo Ask Alice . Just good.Has anyone else noticed that the cover looks just alittlelike a certain girl part? I don't know what's happened to the current generation of Young Adult Supernatural novels, but they have become very repetitious and filled with fluffy romantic nonsense. Demon Wings, The Fires of a Nightmare, brings back the essence of how fantasy books should be: filled with a sense of urgency and danger, and creatures that could quite possibly frighten you to your very core. The antagonists in this book truly fit their description as demons, and uses a realistic approach to Lilianna's nightmare. The story is compelling, and the characters quickly become your heroic champions. I think what I love most about this book is that although there is a strong romantic bond (that will capture your heart), it is not the most important piece of the book and could be enjoyed without it. 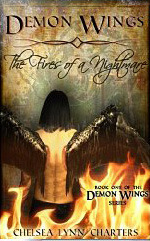 I highly encourage everyone to read Demon Wings, and begin the journey through this awesome tale. This was a well written fantasy novel and I absolutely enjoyed it. Sometimes you read a book that you want to like but end up not liking it simply because it could have been so much better with a little work and effort. This is one of those books. The author claims that the work is aimed at “YA” audiences but I have to ask why? A book on this subject with these characters could have a much broader appeal if it were better written. I will provide an example later on. Besides, most “YA” books don’t use the foul language that is used in one small section of this book.First off, the word “sigh” and all of its variations is way, way, way, way, way, way, way, way, way, way overused. It gets to a point, early on, that it becomes a distraction. In real life, people really don’t sigh that often, much less every other paragraph.Second, everyone “wanders” in this book. The saying “All who are wander are not lost” does not apply to this work. I think the author was lost and did not take the time to search for more meaningful action words. In both of the cases above, the words used are passive in nature in what is supposed to be demonic thriller. Maybe if the characters in the book were more like real people who feel agitated, angry, tense, apprehensive, overwhelmed, and the like, the book would move at a faster pace. Maybe instead of wandering they strode, ran, boogied, or skulked along, we would be more apt to go with them.Third, when I write a story, I try to tell it from the most interesting character’s perspective. That is not done in this book but if it were, it would be much better and it would appeal to a larger audience. Lily, the protagonist, is achingly dull. We know little about her except that she is 20, lives with her parents, works at a coffee shop, and has trouble with men--very typical. She regularly gets into trouble and has to be saved by Seth just like Superman saves Lois Lane. But Lily is not Lois. Lois gets into trouble because she is bold, bright, and curious. Lily gets into trouble because she is slow witted—at best.Fourth, there is absolutely no reason to tell the story from Lily’s perspective when you have Seth, a half human, half demon, man with incredible powers and a great set of wings. If the story was told from his angle, the action would have been amped up.In one scenario, Lily disregards Seth’s advice, and gets, predictably, into trouble with two full blooded demons. What ensues is a “battle” that is more like grade school yard fight (You gonna make me?) and that is because Lily is describing the “action”. If Seth had done so, it would be better:“After searching the woods for what seemed like hours, Seth finally spied Lilly at the Hot Springs where two demons were in the process of carrying her away. He could not let this happen; he had sworn to protect her at all costs, even if it meant giving up his life. In an instant he swept down upon the trio and engaged the two demons in a fight to end. Whose end, only time would tell.”Not surprisingly, the dream sequences in this book were the best part even if the wording was clumsy (a “large” scream as opposed to a “loud” scream) and I think the reason for this is because Lily, per se, is not in them. I won’t say who is in them because I don’t want to spoil anything for those who choose to read this work. If you are a “YA”, you may like this story and I do suggest you read it. If you are over the age of say 13, you might want to wait for a re-write. Chelsea Lynn Charters - Hello! My name is Chelsea Lynn Charters. I'm 21 years old, and I love to write! I've been writing since I was 13, and I have a few fanfictions uploaded on fanfiction.I just published my first YA novel, The Gossip Web, which is available now as an ebook on . If you love YA romance, check it out!